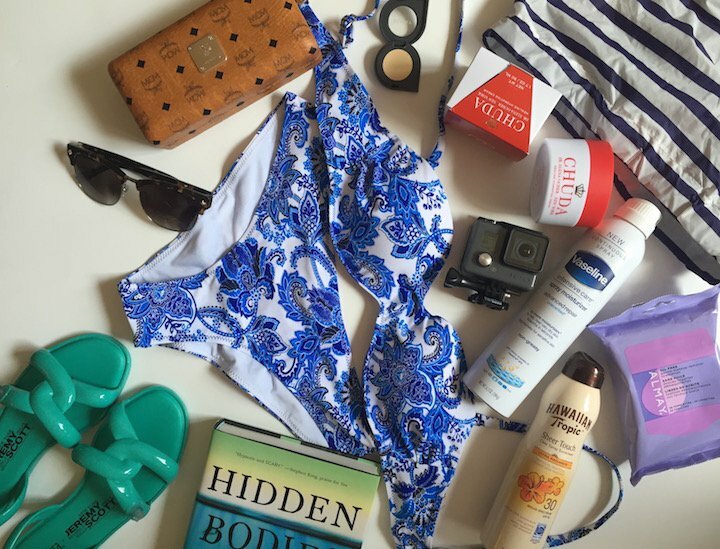 Vacation Checklist: Pack these ten summer essentials on your next summer vacation to the beach. 1. A book for the beach. Obviously, some good reads are part of many people’s summer essentials, and for vacations, the same rules apply. Something easy, fast, and of course enjoyable is course the most ideal; many people’s favorite beach genre being the mystery. If you love a good thriller at the beach, or anytime, you need to add Hidden Bodies to your beach reading list this summer. The new book in the series by Caroline Kepnes is the sequel to YOU, and is so good you could probably read the whole thing in one beach sitting. (Depending on your number of distractions of course). 2. The perfect pair of easy travel sandals. These jelly shoes from the Melissa collaboration with Jeremy Scott are so cute and comfy and I love the color! Lightweight, and easy, they’re the perfect packing essential; plus their versatility allows for a casual beach day, or evening out. The Melissa line is always fun, and unique, and this limited edition line with Scott will have everyone jelly. Buy them here. 3. Good Sunscreen. Protecting our skin is more important than ever, and there is just no excuse anymore for ever enjoying the beach without protection. Hawaiian tropic sheer touch sprays on light and evenly for full coverage for hours in the sun. Plus it smells like summer and even leaves your skin with a shimmer. 4. A new summer suit. The new Anabel Arto collection boasts lots of fun prints, including this paisley bikini above which includes a versatile top that can be worn many ways. Depending on your mood, you can switch it up from regular to bandeau, to halter. 5. Go pro. For the adventurous traveler, this camera is perfect for excursions in the water, or out of it. 6. Chuda skincare. This luxury cream is an essential for your beach vacation. 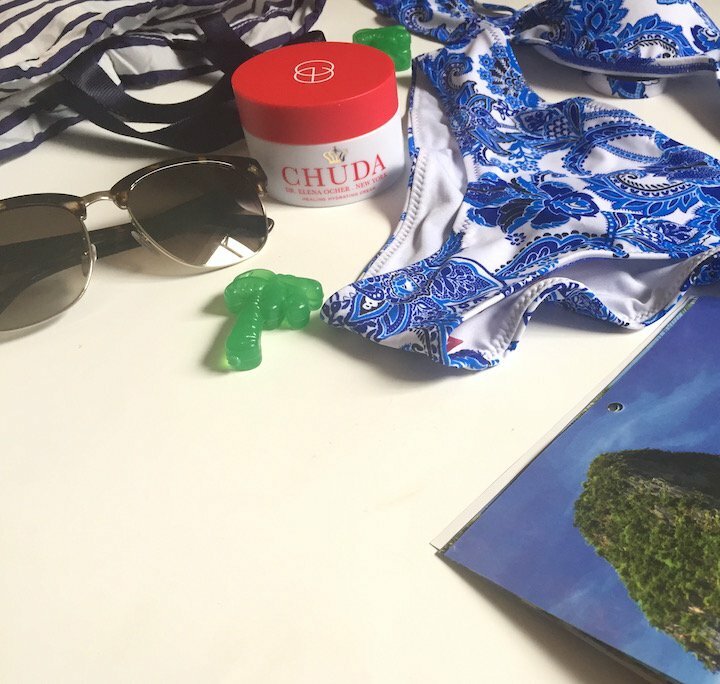 Not only does it hydrate and heal, but Chuda was formulated specially for after sun care to prevent and aid in healing from burns and restoring skin. It’s a necessity after long vacation days no matter where the location. Learn about Chuda Skincare. 7. Almay face wipes. Perfect for traveling, on long days or nights when a proper bathroom routine just won’t do. Shop Almay here. 8. Vaseline intensive care spray moisturizer. The ultimate in on the go skincare, Vaseline is perfect for every day use, but also great for vacation. Its easy, super fast application absorbs in seconds and instantly leaves you feeling soft and clean. It will make getting ready after a long day at the beach well… a day at the beach. More on the spray moisturizers here. 9. Sunglasses. The MCM frames were gifted at last week’s Vision Expo and are the perfect accessory for the start to summer, including your first beach trip of the season. 10. Gold eyeshadow. Right now I’m all about yellow and gold lids. And I’m not the only one. Pat MgGrath also recently used marigold in her shows. I’ve always been a fan of the shade, but of course once someone notable takes notice it finally gets the limelight. Yellow shadow doubles as an eye brightener, and is perfect for opening up tired morning peepers. Especially after long nights on the beach doing whatever. Almay. This is a great list of things that I will need.